Ó 1937 go 1964 bhí príomhpháirt aige in Oireachtas na Gaeilge agus ba é ba thúisce a chuir chun tosaigh in 1937 go ndéanfaí an fhéile a athnuachan agus ba é a bhí i gceannas na réamhoibre. Tá cuntais air in: Who’s Who, What’s What and Where in Ireland (1973); ag Anraoi Ó Braonáin in Béaloideas 57, 1989. In Cuimhní Cinn an Oireachtais (1997), in eagar ag Seán Mac Mathúna, agus arís in Feasta, Nollaig 1989 (‘Ómós ó Uachtarán Chonradh na Gaeilge’), molann Proinsias Mac Aonghusa a shaothar. Cuireadh ar fáil le haghaidh an chuntais seo fuaimthaifead d’agallamh a chuir Diarmuid Breathnach air le haghaidh na sraithe teilifíse Fios Fátha i dtús na 1970idí. I nGaorthadh na Péice, Béal Átha an Ghaorthaidh, láimh leis an nGuagán, a rugadh é ar 5 Meán Fómhair 1905. Ba é an dara mac é ag Séamus Ó Muimhneacháin, feirmeoir, agus Hannah Hyde. Bhí ceathrar mac eile agus beirt iníonacha acu. 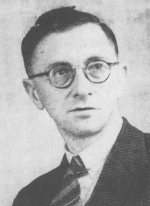 Deirfiúr leis ba ea an t-amhránaí cáiliúil Cáit Ní Mhuimhneacháin (1918-49). Deir a macsan Fionnbarra Ó Tuama gurbh ó Shliabh Luachra a tháinig a muintir i dtosach báire: ‘Tar éis dóibh aistriú as san, chuireadar fúthu ar Ghort na Scairte. Roinnt blianta ina dhiaidh san d’aistríodar arís agus d’imíodar chomh fada le Cathair na Cátha lastuaidh de Bhéal Átha an Ghaorthaidh. Cuireadh as seilbh as san iad féin agus fiche teaghlach eile in aon lá amháin le linn aimsir na bPéindlíthe toisc gur imigh mac leo le sagartóireacht go Lováin. Ba ina dhiaidh san a chuireadar fúthu ar Ghaorthadh na Péice’ (leabhrán an dlúthdhiosca An Joga Mór, amhráin Cháit Ní Mhuimhneacháin a cuireadh amach in 2001). Ba é sinsheanathair Aindriais a tháinig go Gaorthadh na Péice. Bhailigh Seán Ó Cróinín seanchas óna athair (réamhrá le Seanchas an Táilliúra). Bhí Aindrias féin in ann dul siar na seacht nglún: Aindrias, Séamus, Seán, Séamus, Seán, Conchubhar, Eoin Mór; bhí gaol gairid ag a shinsir i bhfad siar leis an bhfile Séamus Mór Ó Muimhneacháin. Bhí léamh agus scríobh na Gaeilge ag a athair: ó Chonchubhar Mac Coitir, scríobhaí, bailitheoir dhánta Mháire Bhuí Ní Laoghaire, a d’fhoghlaim sé go príobháideach iad nuair a bhí an máistir scoile sin ar lóistín san Áthán in aice le crois an Ghuagáin. Is mar seo a bhí muintir Mhuimhneacháin i nDaonáireamh 1901: John Moynihan, feirmeoir (67), agus a bhean Mary agus gan acu ach Gaeilge; a mic James (36), John (26) agus a n-iníon Honora, a raibh idir Ghaeilge agus Bhéarla acu. Ní raibh an tseanlánúin sa teach le linn Daonáireamh 1911 agus is mar seo a bhí: James agus a bhean Johanna a bhí pósta le hocht mbliana, agus a dtriúr mac John (7), Andrew (5), James (2), agus Béarla agus Gaeilge acu go léir. Cuireadh bunoideachas ar Aindrias i scoil Chéim an Fhia. Bhí sé ina mhúinteoir taistil Gaeilge agus ina thimire i gContae Chiarraí 1925-29 agus i gContae Chill Chainnigh in 1929. Bhí sé ina ollamh i gColáiste Chaoimhín, coláiste ullmhúcháin i nGlas Naíon, ar feadh 1929-39. Nuair a druideadh an coláiste sin bhí sé bliain gan phost ach lena linn d’ullmhaigh agus d’fhoilsigh sé Seodcha na Gaeilge agus Duainirín Éigse. I rith an ama sin freisin a thosaigh sé ar dhíolaimí filíochta a ullmhú i gcomhair na scoileanna; d’fhoilsigh sé breis is seasca díobh idir 1942 agus 1972. Anuas go dtí 1945 bhí sé i gceannas ar scéim faoin Roinn Oideachais chun céimithe ollscoile a oiliúint mar mhúinteoirí Gaeilge agus ón mbliain sin go 1971 bhí sé i gceannas ar chúrsaí oiliúna na bprintíseach i gColáiste Mhuire, Sráid Cathal Brugha, Baile Átha Cliath. Pearsa mhór i saol na Gaeilge ba ea é. Deir Mac Aonghusa: ‘Má bhí duine sa tír arbh ionann a cháil agus scéal na Gaeilge i súile an ghnáthdhuine b’shin Aindrias. Níor ghá le caoga bliain a shloinne a lua. Thuig an pobal trí chéile cé hé Aindrias agus sin comhartha measa i dtír ar bith.’ Bhí sé ar Choiste Gnó an Chonartha ar feadh 1930-70, ina chathaoirleach ar an gcoiste a d’athbhunaigh an tOireachtas in 1937-39, ina Chathaoirleach ar an Oireachtas ar feadh 1945-62, ina uachtarán ar Oireachtas 1964 agus ina phátrún ag an bhféile as sin amach. Bhí sé ina uachtarán tamall ar cheann de na craobhacha ba dhíograisí i mBaile Átha Cliath, Craobh Moibhí. Bhí sé ina chisteoir ag an gCumann Scoildrámaíochta 1934-38 agus ina rúnaí freisin 1934-35. Thug sé óráid an Oireachtais in 1942 agus arís in 1948; bíodh go raibh sé solabhartha mar óráidí ba mhó, b’fhéidir, a bhaineadh daoine pléisiúr as stíl nósach agus gothaí na hóráidíochta aige ná as substaint a chuid cainte. Mhínigh sé do Bhreathnach go raibh baint ag a chumas óráidíochta leis an dúil a bhí aige riamh san fhilíocht a reic agus leis na seanscéalta fiannaíochta a chloiseadh sé ina cheantar dúchais. I sraith phaimfléidí an Chonartha a foilsíodh a aistí Na Múinteoirí Taistil (1966) agus An Claidheamh Soluis (1966). Chuir sé eagar ar Duais-aistí an Oireachtais (1972) agus Flós Fómhair (1973). Scríobh sé Dóchas agus Duainéis: Scéal Chonradh na Gaeilge 1922-1932, , leabhar a bhuaigh Comórtas Dhonncha Uí Laoire do shaothar taighde ag Oireachtas 1974; roghnaigh an Club Leabhar an leabhar sin don séasúr 1975-76. Le Diarmuid Ó hAlmhain, Leon Ó Dubhghaill agus Éamonn de Barra bhí sé ina bhall den Choiste Raidió a bhunaigh an Conradh in 1935. Na cainteanna a chraol siad chun Gaeilgeoirí a spreagadh chun oibre foilsíodh iad sa leabhrán An Gael agus an Radio (1935). Bhí baint aige leis na cláir raidió i gcomhair scoileanna agus leis na leabhráin a bhain leo, Craolacháin i gcóir Scoileanna na hÉireann (1937-41). Bhí a cheachtanna Gaeilge ‘Listen and Learn’ á gcraoladh ar Radio Éireann 1945-48 agus arís 1951-54. Foilsíodh an cúrsa mar leabhair freisin agus díoladh tuairim 70,000 cóip díobh. Bhí guth breá aige agus fuair sé oiliúint mar amhránaí ó Vincent O’Brien, Stiúrthóir Ceoil Radio Éireann, mar mhalairt ar cheachtanna Gaeilge. Tá ‘Seal do bhíos im (b) maighdean tséimh’ agus ‘Eochaill’ á gcasadh aige ar an dlúthdhiosca An Joga Mór. Bhí sé ina bhall den Chumann le Béaloideas Éireann ó 1927, ar choiste an Chumainn ó 1947 amach, ina uachtarán air 1965-87 agus ina éarlamh as sin amach. Comharsa i nGaorthadh na Péice ba ea Tadhg Ó Buachalla agus ba é Aindrias a chuir eagar in Seanchas an Táilliúra (1978) ar an ábhar a bhailigh Seán Ó Cróinín. Chuir sé leagan Béarla ar fáil in Stories from The Tailor, . Garchomharsa don Táilliúir ba ea a athair agus bhí dlúthaithne ag Aindrias féin air. D’aistrigh sé ón mBéarla an cuntas ar stair Chorcaí a bhí scríofa ag an Athair Micheál Ó Flannagáin dar teideal: Corcaigh (1947) (County Histories VI: Cork). Bhí sé ina bhall de Chomhlacht Comhairleach na Gaeilge 1966-69 agus ina dhiaidh sin ina bhall de Chomhairle na Gaeilge. Phós sé Mairéad Ní Nualláin (d’éag ar 8 Aibreán 1990) in 1937 agus bhí cónaí orthu i nDomhnach Broc; ní raibh sliocht orthu. D’éag sé ar 14 Samhain 1989 agus tá sé curtha i nGlas Naíon.